Electric Scooters Are Everywhere, Upping Hospital Visits And Pedestrian Hassles Electric scooters provide users with a fun, quick and affordable mode of transportation. But medical experts are observing a growing public health concern, and officials are slow to provide solutions. Matthew Lachance rides an electric scooter in Washington, D.C. Scooters have grown in popularity, and now ride-related injuries are a common sight at the George Washington University Hospital, according to Dr. Kate Douglass. Stand-up electric scooters have been around since the 1980s. But the latest trend in micromobility — dockless electric scooters — launched in 2017. They arrived in the District of Columbia in 2018, and now, just over a year later, thousands of scooters are on the streets. 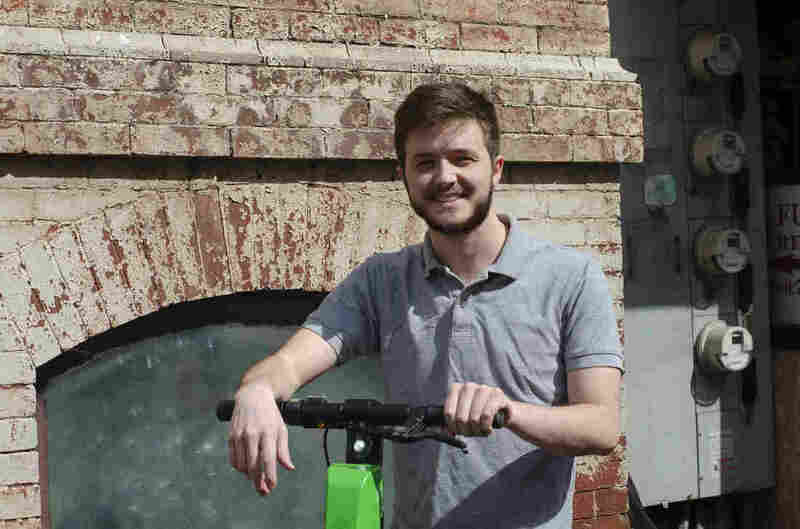 "They sort of just popped up out of nowhere," says Matthew Lachance, who works in fundraising for an international AIDS relief nonprofit in D.C. Lachance says he rents scooters often, even throughout the winter, because they're fun and convenient. Lachance says he rents scooters often, even throughout the winter, because they're fun and convenient. But not all rides are quite so fun. Some end in injuries. Scooter-related injuries are a common sight at the George Washington University Hospital, says Dr. Kate Douglass. "Almost during every shift, you'll see somebody come in with an extremity injury or a head injury or a laceration or something along those lines," she says. Douglass says that's partly to do with how riders actually use them. With riders in the streets, in the bike lanes and on the sidewalks, there's a greater potential for injury. Dr. Joann Elmore sees the same things in emergency rooms in Los Angeles. Elmore was the principal investigator on a team from the University of California, Los Angeles that looked at scooter injuries over their first year as a ride-share offering in L.A. In their study, published in January, they observed the most common injuries to be fractures and head injuries — about 30 percent and 40 percent, respectively. They also discovered that, of the scooter users they observed, fewer than 5 percent were wearing helmets. [Scooters are] immensely easy to use and ... given this ease, many of us underestimate the potential for public health and trauma-related issues. "It is immensely easy to use and ... given this ease, many of us underestimate the potential for public health and trauma-related issues," she says. But even though injuries can be common, Douglass at George Washington says the injuries she's seeing are relatively minor — broken wrists and bruised knees. Severe injuries and even fatal injuries are far less common. And most injuries are preventable. Injury prevention is also on the minds of micromobility companies. They are working to educate their users on how to ride safely through city streets. They're also working to educate users on where to leave scooters when they're no longer needed. Juliette Rizzo is a disability rights activist and pedestrian advocate who leads what are called "walking audits." The goal of the audits is to assess pedestrian access. In other words, what challenges stand in the way of safely navigating a city? During a recent walking audit in downtown D.C., Rizzo brought attention to a scooter found blocking the sidewalk. This prompted a conversation with Beaudry Kock, who was along for the audit. 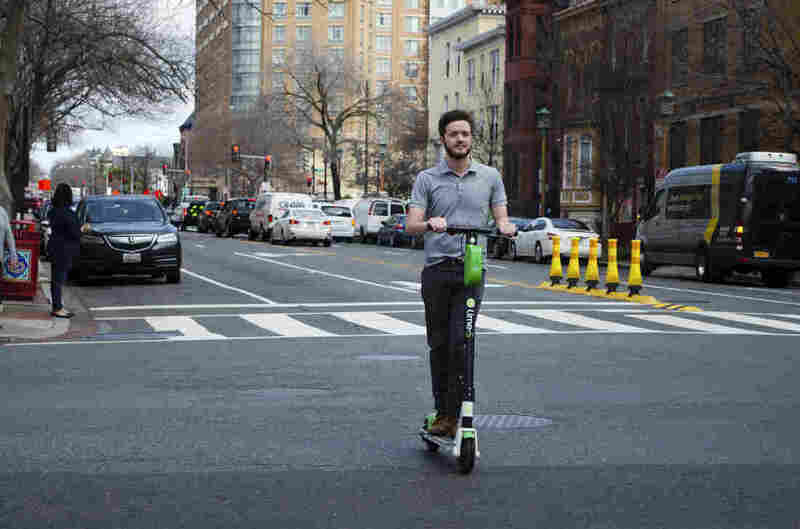 He works for Spin, one of the five companies with licenses to operate scooters in Washington. Kock voiced his frustration about scooter placement. "There's no excuse. There's really no reason," he said. Kock said the responsibility of scooter placement is just as much on the companies as it is on the users. 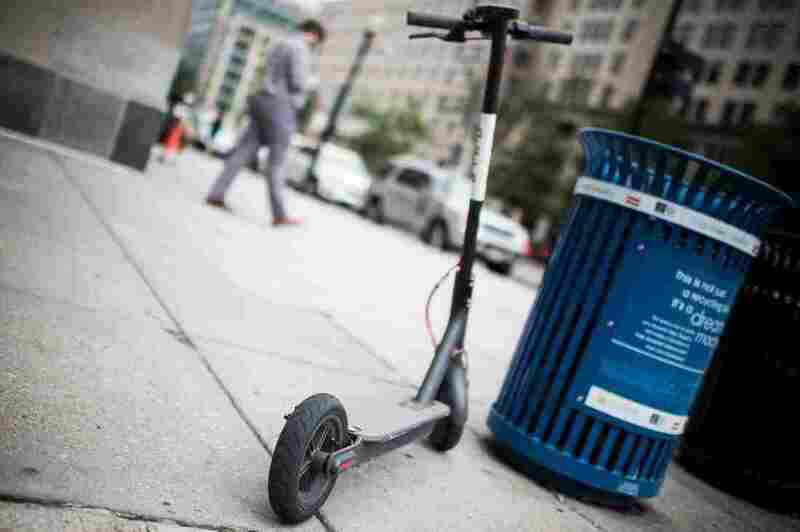 A Bird electric scooter found parked on a sidewalk in Washington, D.C. Pedestrian advocates are concerned about scooters blocking sidewalks. Ultimately, most of these companies feel that the best way to address all safety concerns is to push for long-term solutions — solutions like redesigning city streets and improving traffic flow for all vehicles, including bikes and scooters. The District Department of Transportation agrees. Jonathan Rogers, a policy analyst at DDOT, says that infrastructure and building safe streets are the foundation of tackling scooter-related issues. But improving infrastructure and building safer streets make for a slow and expensive process. The same could be said for building safer sidewalks. While temporary measures like flex posts and paint can help in the short term, most of the solutions are still months, if not years, away.